Often as a pet people give birth to a turtle, and most often red. On the market they sell very quickly, which is evidence of the growing popularity of this species of reptiles. Systematics of the species trachemys turtles are very messy. Their carapace is relatively flat. The young of these reptiles observed the light green tint of the shell, with age, the color changes into light brown or olive, then it appears the patterns having the form of vertical yellow stripes that are particularly visible in the water. Behind eye the red-eared terrapins is the red spot elongated shape. Thanks to him, it owes its name. On the head, neck, and limbs of reptiles there are stripes of white and light green colors. The red-eared terrapins live long enough. Their average length of life in good conditions is about 30 years. To keep these pet reptiles need only spacious aquaterrarium. Fish tank for one turtle must have a volume of from 100 to 150 L. the Greater part of his life trachemys turtles spend in the water. However, for recreation and walks, they still need drying. Your attentive hosts are attached to the wall of the aquarium plastic island and limited. But really, it's not enough. Climbed turtle will be difficult. In specialized stores you can find Islands for turtles, which meet all the requirements. The size of the accessory must be at least a quarter of the area of the aquarium. Why the tortoise shell can become soft and what to do in this case? 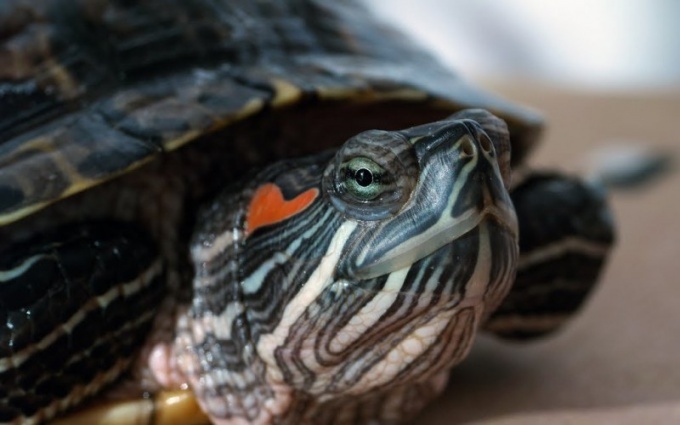 The red-eared terrapins - being weak, and even living in captivity, can get sick at any moment. A sign that the turtle is not healthy are symptoms such as soft shell, sluggish behavior, poor appetite. The turtle shell is softened due to lack of UV light, that pet can lead to the deterioration of the absorption of minerals and vitamins. To avoid problems with the health of the turtles it should be regularly irradiated with ultraviolet light, which is sold in almost any pet store or a specialized online store. This is a mandatory condition of captivity the red-eared terrapins, are able to maintain her health. In the diet of the red-eared terrapins have to be raw fish. In such foods containing small bones fish, essential for proper nutrition home reptiles. You can additionally give your pet calcium and vitamins. But we should not mix them with the main food of the red-eared terrapins. They are readily soluble in water and have a positive effect on her health.